Thursday night, after watching Kim Kardashian spend the day at Disneyland with her family (including Nori in a very cute Elsa ensemble), I stared breathlessly as she went through a pregnancy scare. No, I was not beside her at this time—we aren’t yet close friends—I just kept up with her Snapchat story. Though not a lengthy narrative—just three brief snaps—the story made for some of the most compelling material I’d ever seen on the platform in...a few hours? 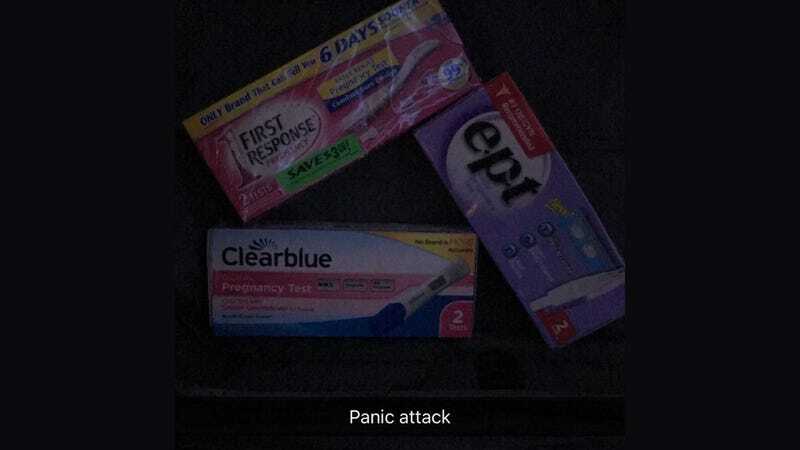 It began with a photo of three boxes of pregnancy tests: ClearBlue, E.P.T., and First Response. With two tests in each box...oh god, she was about to take SIX! “Panic attack,” the caption read. False alarm! I returned to my own Snapchat story, where I continued documenting a rewatch of October Sky. There’s dressing room drama at The Today Show! If that news is counteracting your morning coffee, just wait, because it’s actually pretty juicy. Now that Natalie Morales has left the New York team, her dressing room in the “morning show’s overcrowded, antiquated Studio 1A” is up for grabs. Though reportedly teeny tiny, the room is on the “studio’s more desirable third floor,” and is next door to Matt Lauer’s room—which may or may not be convenient, depending on whether you’re into that sort of thing. New hire/my nemesis Billy Bush apparently thinks it’s going to go to him, Queens Hoda and/or Kathie Lee might want it for themselves, and Jenna Bush Hager (the show’s most insufferable co-host) “has eyes on it” too. Who will get it? No one knows, but I’m sure the fight could make for a compelling follow-up to this. Imagine running into Jessica Chastain on the subway.